Drinking pickle juice for cramps might sound like a dirty trick someone’s playing on you. After all, how could sour pickle juice possibly help cramps? Well it might come as a surprise, but it’s a remedy that top-tier and recreational athletes use regularly to alleviate painful leg cramps quickly and effectively. If you suffer from leg cramps, or experience any form of cramping for that matter, pickle juice might help you. Its unique formula of cramp-fighting compounds can ease your pain faster than water, sports drinks, and other measures you might have used to battle cramps in the past*. Cramps are extremely frustrating to experience, and they’re also a source of confusion regarding where they come from. Traditional wisdom points to dehydration as the origin of most cramps. The theory goes that when your body is low on water, it can’t supply valuable nutrients to your muscles, and in the absence of vitamins, minerals, and electrolytes, muscles can seize up and cramp. Electrolytes such as sodium and potassium are the most important in this theory of dehydration, as they help to conduct nerve impulses throughout your body. When they can’t be carried where they need to be, the reaction ceases and cramping occurs. The other theory regarding cramping has to do with muscles being overworked and fatiguing prematurely. Neurotransmitter communication becomes skewed and muscles keep firing, causing rapid contractions that create cramps. This is why cramping tends to occur in concentrated areas and not throughout the entire body at once. Recently, the dehydration theory has lost a little bit of steam, and pickle juice has a lot to do with this. While dehydration can cause cramping, it might not be the reason you experience cramps during certain activities such as running, playing sports, or cycling. In any event, drinking pickle juice for cramps is a good treatment regardless of why they occur. Does Drinking Pickle Juice Help Prevent Muscle Cramps? Is pickle juice good for leg cramps? Pickle juice can help battle and prevent cramps for a couple of reasons, but the main reason might surprise you. Although it’s rich in water and electrolytes—it has more sodium than top sports drinks—it’s also acidic, which is where its real power lies. Research shows that pickle juice for leg cramps at night or during the day works better and faster than water by a rather large margin. But what’s so interesting is that it takes less time for pickle juice to relieve leg cramps than it does to be absorbed in the stomach—meaning it’s not the water content or electrolytes that are responsible for its cramp-fighting prestige, as it doesn’t have time to be absorbed into the bloodstream by the time the effects are felt. A team of researchers from Brigham Young University and North Dakota State University electrically induced leg cramps in 12 subjects and treated them with either pickle juice or water. The participants who drank pickle juice for the leg cramps saw the symptoms diminish in less than a minute a half, while the water group had to wait two minutes for their symptoms to disappear. Because of the time difference, it appears hydration levels had little to do with the cramping. If it did, it’s likely the response time would have been much closer. Furthermore, it didn’t appear that electrolyte levels were altered to the degree that would impact muscle function. So what is it about pickle juice that makes it ideal for leg cramps? 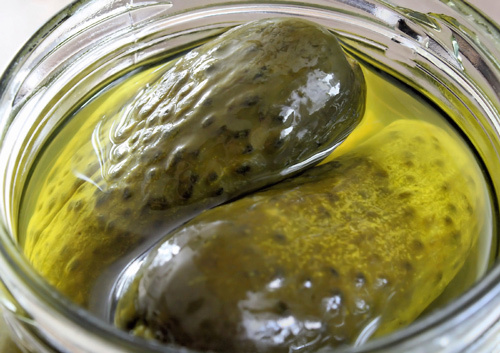 What’s in Pickle Juice that Helps Prevent Leg Cramps? Pickle juice appears to treat leg cramps because of its acidity, which seems to trigger a reflex when it hits the throat, sending a signal to relax the muscle. The over-stimulated neurons, which are malfunctioning and reacting from overuse, are then reset so that regular communication with your nervous system is resumed. When this happens, the contraction stops, the muscle relaxes, and the cramping subsides. The results show that leg cramping might not have anything to do with dehydration at all, but rather with some confusion in the central nervous system. Researchers still aren’t sure why the acid seems to be the perfect remedy for cramps; they just know that it works. There are also reports that drinking vinegar offers the same results—however, your taste buds might be a little more in tune with shot of pickle juice compared to some straight vinegar! If you need to handle a leg cramp in a hurry, pickle juice is a highly effective remedy. It can help you get back on the playing field, continue your jog, ride your bike, or work out, and it can even help you during those random times when you’re hit with a cramp and don’t want to withstand the pain. How Much Pickle Juice Should You Drink for Cramps? One of the best parts about pickle juice is that you don’t have to carry around a big bottle of it; all you need is about three ounces, or a little under half glass, to handle leg cramps. If you pour a little out of a full pickle jar, just top it back up with vinegar—you don’t want to waste your pickles! On that note, you might be wondering what kind of pickle juice for leg cramps is best. The answer is simple: common dill pickles are the ones you’re looking for. Pickle juice is essential for athletes because it allows them to both prevent cramps and quickly deal with them should they arrive. It lets them train, compete, and perform at their highest level. Because it only takes such a small serving and acts so quickly, it’s very easy to consume on the go when symptoms arise. Pickle juice before exercise can also help give you what you need to perform your best. But it’s not just its ability to kill cramps that makes pickle juice so beneficial to athletes—there are also valuable nutrients to keep your body running at a high level and aid in the recovery process. Research has indicated it works virtually the same as sports drinks in supplying important electrolytes such as sodium and magnesium, as well as nutrients such as calcium, all of which are very important for athletic performance. The sodium content in two ounces of pickle juice, for example, offers 400 milligrams of sodium, while sports drinks have 225 milligrams in the same serving. Another component of pickle juice that might beneficial to athletes is that it may help replenish glycogen stores during and after workouts. The acetic acid can help metabolize carbohydrates and fats. Drinking pickle juice for cramps can offer quick relief, but it can also be used for several other conditions. Hangover cure: It helps to replenish sodium levels that have been lost through dehydration. Although dehydration might not cause cramps, it does make a hangover worse. Exercise: You need lots of nutrients during intense exercise, and drinking pickle juice before a workout gives you what you need. Pickle juice for menstrual cramps: PMS can result in plenty of lost fluids and nutrients, so drinking pickle juice can help to keep you hydrated and alleviate cramping. It can also help tame salt cravings. Of course, there are other leg cramp remedies; pickle juice isn’t the only one. Here are a few more ideas to relive the pain! Stretch (this works for most cramps, especially in the calves). Apply heat to the area (using water or a heating pad). Sleep with your toes pointed up or to the side. Ensure you have an adequate calcium intake. Making sure you eat salt, but not from processed foods; table salt and sports drinks are fine. So, does pickle juice help cramps? It may seem odd, but the answer is yes. So don’t throw out the juice when you’re done with that jar of dill pickles—it could save you some discomfort in the future! Miller, K., “Electrolyte and Plasma Changes after Ingestion of Pickle Juice, Water, and a Common Carbohydrate-Electrolyte Solution,” Journal of Athletic Training, September 2009; http://natajournals.org/doi/abs/10.4085/1062-6050-44.5.454. Pointer, A., “What Are Muscle Cramps,” Web MD, March 12, 2014; http://www.webmd.com/sleep-disorders/tc/nighttime-leg-cramps-topic-overview, last accessed March 24, 2016. Feeney, H., “5 Ways to End Muscle Cramps,” Active web site, 2016; http://www.active.com/fitness/articles/5-ways-to-end-muscle-cramps, last accessed March 24, 2014. Kimball, M., “Can a shot of pickle juice alleviate muscle cramps?” The Times–Picayune web site, March 30, 2015; http://www.nola.com/healthy-eating/2015/03/pickle_juice_for_muscle_cramps.html, last accessed March 2016. Davs, J., “Can Pickle Juice Really Cure Muscle Cramps?” Runners Connect web site, http://runnersconnect.net/running-nutrition-articles/pickle-juice-muscle-cramps/, last accessed March 24, 2016. Reynolds, G., “Can Pickle Juice Stop Muscle Cramps?” The New York Times web site, June 9, 2010; http://well.blogs.nytimes.com/2010/06/09/phys-ed-can-pickle-juice-stop-muscle-cramps/comment-page-6/?_r=0, last accessed March 14, 2016.